School was from 8:00 each morning until 12:30 each day and to make up the hours included Saturday mornings. So leisure time was all afternoon and evening plus Sundays. For many of us kids it was get the homework done and then head straight down to the swimming pool. These were particularly good pools going from about 2 foot 6 inches deep to 11 feet at the deep end with a springboard, ten foot board and twenty foot board. We would be in and out the water and there was always a session at the NAAFI kiosk, Coke or Pepsi and coconut ice. At the end of the afternoon it would be onto the bicycles and pedal back across the runway and back home for tea. Round about six in the evening it would get dark and that would be the signal to head for home, listen to Radio Malaya and then about eight in the evening it was off to bed ready to get up early in the morning. Next morning about 6:00 it was time to get up to head down to the city for another day at school. Once a week there was a Scouts meeting and that was one of the few days that we were ever allowed to stay up late when there was school the next day. We had some amazing times. My first experience of camping was when we went off to the Singapore Scouts campsite at Jurong. At the gate into the camp we collected tents, pots and pans and duckboards for sleeping on. We wondered what these were for. The camp site was on bare clay and we erected the tents finding it difficult to knock the pegs in. There was also advice that we should dig a trench around the tent but the ground was so baked so hard that we managed to chip about an inch channel around the tent. Two days later when it rained the lesson of keeping everything off the ground and the need for a channel round the tent was quickly learned. With a typical tropical thunderstorm the minuscule trench quickly filled with water and within five minutes the tent was like a streambed. We quickly put on swimming trunks and went out in the rain with spades and dug the trench about six inches deep piling the soil between the trench and the tent to improve the barrier. Digging was of course much easier now that the clay was wet. The following day we rolled the sides of the tent up to allow all of the wet bedding and clothing to dry. Typically, having dug the trenches, there was no more rain all the time that we were there. The site was plumbed with toilets and showers albeit cold showers but that was quite refreshing in the Singapore heat. Next to the site was a rubber plantation and each morning the tappers would come round to collect the accumulated latex and cut a new slice of channel to keep the latex flowing. 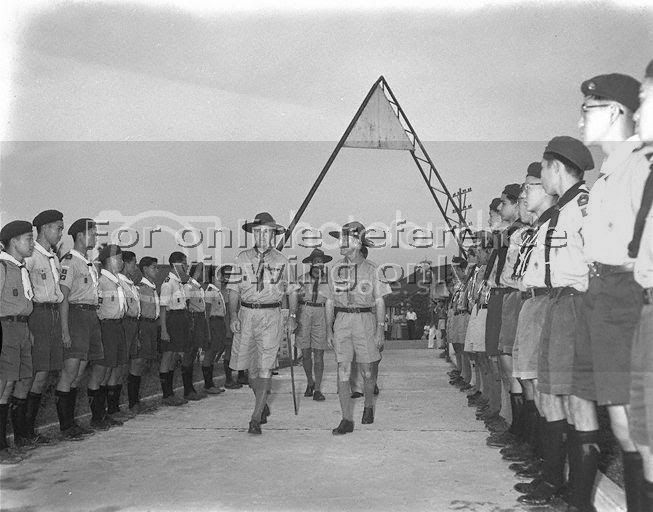 In the scout troop were several Asian boys from the Tengah village just next to the RAF Tengah base. There was Kim who was Chinese, Johari an Indian Moslem and Ranjit who was Indian Sikh. There were one or two others but my memory lets me down and I can’t remember their names. Mixing with Asians at this young age and having a Canadian mother taught me the value of racial tolerance. I feel that it greatly enriched me although I didn’t realise it at the time. We all mucked in together with general tasks, games and learning together. One of the highlights of camping trip was a visit to the old Japanese submarine pens where we all went fishing. It was rumoured that there was an octopus in the pens and there was even a tale that a boy from the RAF Changi troop had slipped in the water and came out with octopus tentacles wrapped around his leg. It sounds a bit far fetched to me now but when I was eleven it sounded fairly plausible to me. On the way back to the campsite, Mike the Scoutmaster bought a load of pineapples for the lunch the following day. 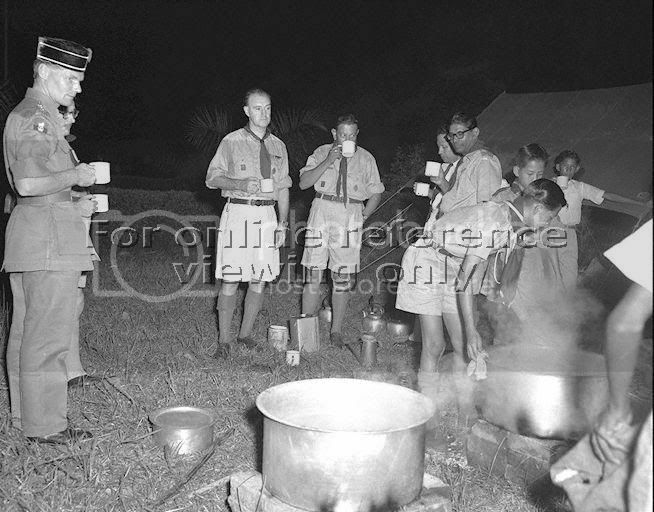 Each patrol was given some custard powder to make custard to go with the fruit. One lad said that he knew how to make custard and proceeded to make it whilst the rest of us got on and trimmed up the pineapples and created pineapple rings. Everybody lined up and was given their allocation of two pineapple rings and then the custard was poured on. We all sat down and before too long there was much groaning and moaning when we tasted the custard. Our custard expert had only forgotten to put the sugar in. Any way, once the custard was scraped off the pineapple rings were wonderful, there is nothing to compare with taste of fresh pineapple. 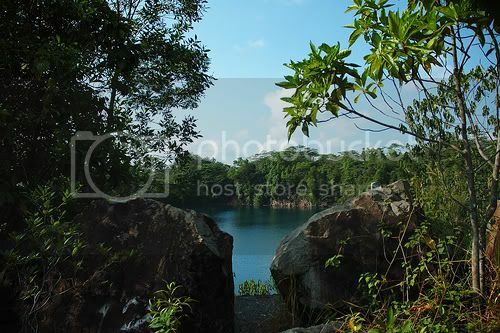 We had a few trips with Scouts and one that was really good fun was a trip to Pulau Ubin a small island just off the coast from Changi. We travelled over from Tengah and then caught a motorised canoe over to the small island where we bivouaced under army capes and cooked food over open fires. 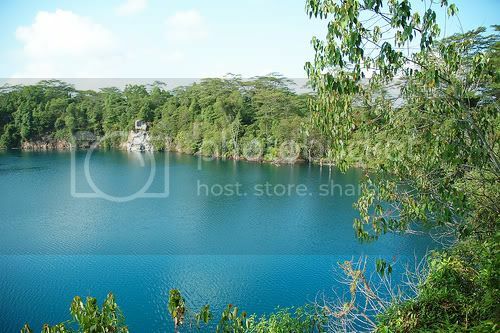 In those days the island had very few inhabitants and the main activity was quarrying. Much of the timber work in the quarry had been lashed together using square and diagonal lashings. The spot we camped on was directly under the flight path for aircraft coming in to land at Paya Lebar airport which was the main Singapore airport in those days. I can remember seeing Constellations with the triple tail and Brittanias. Aside from swimming and scouts, a gang of us would often gather on our bikes and go off to the scrubland at the end of road and meet in one of the perimeter fence towers. There we would usually gather some wood and make a fire and smoke the cigarettes we had pinched from our parents. It was all bravado stuff, I don’t think anybody ever inhaled the smoke. There was also a little bit of woodland with a few remains from a crashed Beaufighter nearby and we often used to gather round it and drift off into fantasies of being a pilot and shooting down Japanese warplanes. One time when we visited the wreckage I found a papery snake skin that had been shed. A few weeks later I was confined to home with a really bad cold. The group had met at the wreckage without me. My friend John Smith, and yes, that was his real name, picked up what he thought was a shed snake skin. Oh no it was not! It was a sleeping cobra. Fortunately, before it could bite him, he was quick-witted enough to throw it away from himself and the snake slithered off into the undergrowth. Another gathering place was the old disused Japanese runway. Being boys, there had to be a gruesome tale attached to the runway and there may be an element of truth in it. The tale was that the runway was built by prisoners of war, many of who were slaughtered on the spot and thrown into the diggings to be covered over with foundation material. Out of respect for the dead prisoners, when the Japanese surrendered the runway was decommissioned and allowed to fall into disrepair. Because we spent so much time at the swimming pool our hair turned dramatically lighter and picked up a green tinge. I’m not sure whether it was colouration caused by the chlorine in the water or whether it was being coloured by minute algae. Whilst we lived at Lloyd Leas, one of our favourite pastimes was to go down to Paradise beach for a swim and inspect the machine gun pill box that stood guard over the cove. I remember one day going down there and there was a very high tide so we laid on top of the sea wall and watched the small fish feeding around the wall. Suddenly the sky turned black and there was whizzing noise. When we looked up there was a whirlwind waterspout right in front of us. My mother shepherded us straight into the pill box where we watched it traverse the cove coming about two feet in front of the pillbox. It then made its way out to sea and fizzled out. It was an incredible sight. Sunday afternoons were always quiet and I would sometimes save a few prawns from my Nasi Goreng that I always had at the families club for Sunday lunch. I would then head down to the fenced in swimming area next to Changi Yacht Club known as the Pagar and spend the afternoon fishing, using the prawns I had saved as bait. Sunday afternoons in Changi village would often see large groups of people playing Mah Jong and cards. The atmosphere in the village was always very relaxed on Sunday afternoons with the only disturbance to the quiet being the click clack of the Mah Jong tiles.